Describe Your Encounter: “I am guessing as to the date since it has been almost 1 year since this sighting. It was a Sunday night and there was a full or nearly full moon with a few clouds and very mild temperature. I am certain of the time of the sighting since I normally walk my dog no later than 9:00pm, but I was late on this particular night because I had been watching a show on TV and was late getting out with her. This was an unusual location to see something like this because I live in a nice, older neighborhood, but it is within a mile of wide open country. I follow the same route walking my dog every evening and I was almost back to my house when I stopped because I saw 2 very large black, hairy things coming down the driveway of the house across the street from my house. Spoke to the witness over the phone on May 5th and then met her in person at the sighting location on May 12th. Each time her story never deviated from her online submission. The sighting took place on a Sunday night as she walked her dog down the street. It was fairly late, maybe even closer to 11:00PM. Her neighbors did not have their outside lights on and the house next to the sighting location has been vacant for a very long time. As Pam was about three houses down from her own home, she noticed the creatures and she immediately froze. The creatures came from behind the neighbor’s house, then down the driveway. As they walked on all fours down the driveway, they looked like huge furry balls. “I would have thought they were bears, if they hadn’t eventually stood up on two legs,” explained Pam. They moved in a “jerky” motion, stopping every second, then crawling forward. 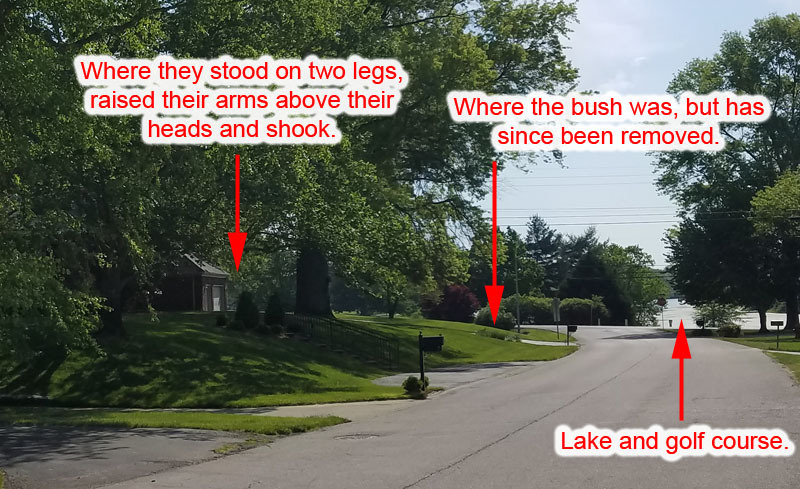 When they reached a large bush at the corner of the driveway (which has since been removed and flowers planted) the 2nd creature backed up, as if they both couldn’t hide behind the bush. They walked back up the driveway on all fours. She could see hair sticking up on their backs due to the moonlight and the streetlight in the background. The security lights on each side of the garage door were off. However the recessed lights under the easement around the corner, on the front of the house, were on and that’s when they stood up on two legs, raised their arms above their heads and shook briefly, “like a dog would shake after getting wet.” The light was not directly on them, they stood in the shadow of the corner, however the recessed light was just around the corner of the house, which was enough light to see the creatures had brown hair, not black. She said their arms were very long and could have touched the roof of the house. Based on where they stood, which is next to the garage, we estimated their height at about 6.5 feet tall. They had human-like silhouettes, with very long arms, all covered in hair. Unfortunately no snouts, ears or tails were noticed as she could not clearly see the heads, as their backs were towards her. It appeared they were looking in the direction of the dark golf course across the street (most likely from where they came). Her dog's reaction? She froze once she noticed them. What was Pam’s emotional state emotional state? Very scared. She also froze in position for fear they would notice her and waited a few minutes after they disappeared around the corner to where she felt safe enough to hurry home. Did she share this sighting with anyone in the area, due to fear of others being harmed? She told her husband, but he didn’t believe her. She also told her nextdoor neighbor to leave her security lights on and that neighbor told the neighbor across the street (sighting location). She did not want to be known as “the crazy lady” so she just told her neighbors they were some “strange people” in the neighborhood. From Pam’s position on the street, the creatures were approximately 75 yards away. 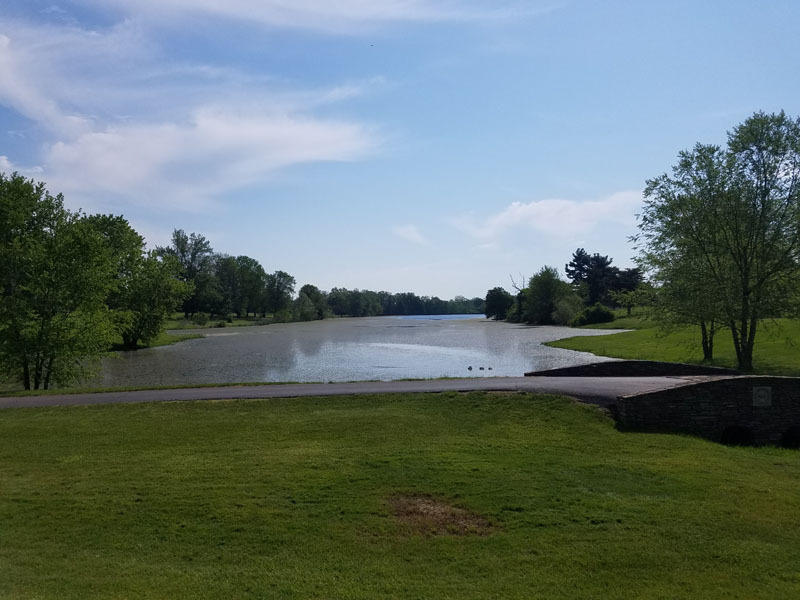 A golf course with a lake is directly across the street from the sighting. A tree-lined creek runs behind the golf course which connects to less populated areas. As the crow flies, there have been Bigfoot sightings only 9 miles north in Smithfield on 9-27-13 and only 12 miles south in 2012 was the location of the possible Waddy Werewolf attacks which mauled livestock on Ditto Road. 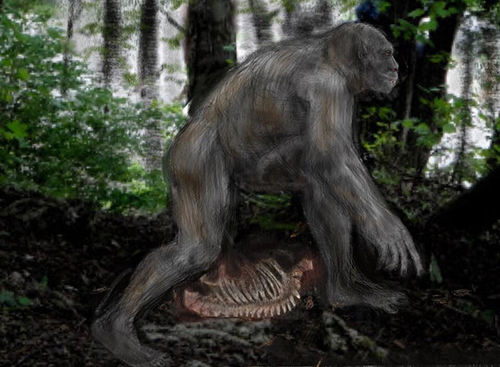 Bigfoots will travel on all fours, especially juveniles. Some might travel as quadrupeds to look less obvious. The creatures in this encounter could have been Bigfoots, or dogmen, or perhaps something else? The witness was very sincere, credible and consistent with her testimony and had no apparent motive to lie. Actually she has more of a risk to be ridiculed. She was brave to share her encounter and I thanked her. She thanked me as well, for believing her, that she’s not crazy. Photos from investigation below. View from the witness position on street. Golf course directly across the road from sighting location. 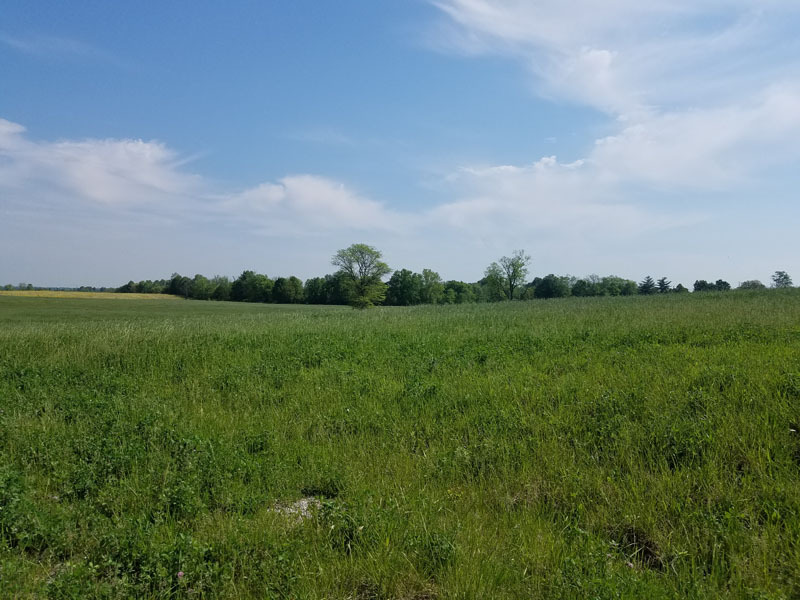 Undeveloped land and pastures just north of the subdivision. Multiple accoiunts of suscipious animal mutilations on Ditto Road in December 2012. Man recalls a family history os sightings in Pleasureville.